Keep this man away from microphones for awhile. I feel like that quote really speaks for how stupid TO’s latest spat was. Who has “done far more worse things” than Michael Vick? I would really like to know. Ray Lewis certainly had a brush with the law and got a second chance, but that’s really the only incident that comes close. The idea that Michael Vick has done his time is ridiculous. He has done his time when it comes to the law, but has really faced no penalty in relation to the NFL. So four games is really just a slap on the wrist. That is like saying John Wayne Gacy didn’t have any real character issues other than the whole serial killing spree. I am not surprised by the comments, and I do think the guy deserves another chance to play, but T.O., you’re an idiot. Or like electrocuting a live dog. Roger Goodell is in the process of deciding Michael Vick's fate in the NFL. It has been widely reported that NFL Commissioner Roger Goodell met with Michael Vick this week, to discuss his possible reinstatement into the league. Vick, on indefinite suspension due to his involvement in dogfighting, is seeking to return to the league after being released from his prison/home confinement sentence on Monday. The commissioner is a disciplinarian, and has wielded his power using the Personal Conduct Policy to clean up the league. Gone are malcontents like Pacman Jones. Suspended are those who break the law. He has been swift and decisive with his authority and the NFL is better off for it. The current scenario regarding Vick’s reinstatement is one that needs to be handled sensitively. On one hand, Vick is a first time offender and is subject to lighter penalties than repeat offenders. On the other hand, Vick was sentenced to prison because he was the leader of a dog fighting ring. Too light a penalty, PETA will protest the NFL and give it bad publicity. Too heavy a penalty, the NFL Players Union will be up in arms over how steep a punishment Vick is given. So what is Goodell to do? It’s been rumored he will give the former Atlanta Falcons QB a temporary reinstatement, while handing down a suspension as the season nears. This would allow Vick to find a team to sign with and attend training camp. ESPN.com is reporting that Goodell has decided to suspend him for 4 regular season games, which has been disputed by NFL officials. What Goodell should do is what is rumored, and that’s to temporarily reinstate Vick. Let him go find work and report to training camp. Let him go through the rigorous 2x-day workouts in the dead of summer. And then right before the season starts? Suspend him for the year. Yes, this screws over the team that signs him. But signing Vick is a risk unto itself, given that nobody knows how long his suspension is for or if he can still play. Why should Goodell do this? To really teach Michael Vick the lesson he needs to learn: don’t lie. 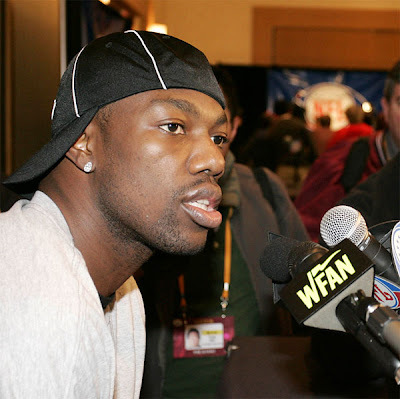 Vick lied to the commissioner’s face when the dogfighting accusations were originally made. He repeatedly denied any involvement, even meeting with Goodell in New York and telling him to his face that he was not involved in any way. Jump ahead a little ways and we know he lied through his teeth. He was the ringleader of a multi-state dogfighting operation, breeding, fighting and killing dogs for sport. If you look a man in his eyes and lie to his face, you don’t deserve any favors from that man. Roger Goodell should exact his revenge on the quarterback. Teach him the lesson that he apparently never learned growing up; lying is wrong and there are consequences for it. And no, I don’t consider his two years out of the league as punishment. He was in prison and thus couldn’t play anyways. Yes, he was “indefinintely suspended” by the league following his sentencing. Fact is, even if he wasn’t suspended, the Falcons would have been able to withhold paychecks because he wasn’t fulfilling his contract or playing in games. He’s eligible to play in the league now, therefore he should begin serving his punishment now, when he’s able to play. And is my punishment steep? Yes. And it should be. You aren’t supposed to lie. You definitely aren’t supposed to lie to your boss, especially one like Goodell who was going out of his way to support Vick during the investigations. So Mike, I hope the commissioner lays the hammer down on you. You dug yourself a hole that you can’t juke or jive out of. Maybe this time you’ll learn. The NFL Draft Goes Primetime… Why? The draft moves to primetime, while it ruins the event for fans. The NFL announced today that the draft will be stretched out over three days. It will now start on a Thursday night for round 1. Rounds 2 + 3 will proceed on Friday night. Rounds 4-6 complete on Saturday. What is the motivation in this? Roger Goodell is fishing for ratings, and he may well get them. But I don’t like it. The draft is an annual event, traditionally a weekend for hope for fans of every team in the league (except the Eagles, who hate all draft picks). Now, it will be a drawn out affair as the NFL sells out to corporate America even more than usual. As I said, the draft has always been an event. Groups of friends clear their Saturdays to gather around the TV, pimping their mock drafts, predicting the next pick while debating the last. Will that continue with the new set-up? I doubt it. Sure, some groups of friends will still get together for the first or second round. But how many will stay together for 2 nights and another full day of draft action? People have lives outside of football, with our schedules becoming busier by the year. This decision will pay off for the NFL, I’m sure, but it will kill the camaraderie the event has embodied in years past. Steve Phillips is another sportscaster who just doesn't have credibility. So I was just watching Baseball Tonight on ESPN, and the topic of trading for Roy Halladay came up. Karl Ravich asks Steve Phillips his opinion on the situation. He proceeds to say that if he was a GM in the game, he would sell the farm for Halladay. Now I have no problem saying “I’d trade almost anything for him,” because Halladay is among the best pitchers in the majors. But Phillips didn’t stop there. He proceeded to name every single top young pitcher in the bigs and offered them to Toronto. This isn’t shocking, coming from the former New York Mets GM who has a long track record of trading future stars for short-term help. He obviously doesn’t value prospects, which is fine to an extent, because they are not guaranteed to succeed. But he didn’t name just prospects. My problem with his thinking is that its not practical, and it perfectly showcases the reason he’s the former GM of the Mets. Consider his Dodgers proposal: trading 21-year old lefty Clayton Kershaw (8-5, 2.95 ERA, 104k, 1.22 WHIP) for 32-year old Halladay (11-3, 2.73, 113k, 1.07). We’ll leave out a breakdown the “others” Phillips would give up (Tony Abreau, Blake DeWitt, James Loney, Andre Ethier, Matt Kemp to name players sure to be requested by Toronto). Let’s just compare the pitchers that would be swapped. What exactly do the Dodgers gain in this? Sure, Halladay’s peripheral numbers are slightly better. But when you consider the cost, both in terms of talent and cash, does this deal make sense? Halladay is on the hook for the remaining of his $14m+ for this year, and $15.75m for next year, after which he’s free to go as a free agent. Kershaw, on the other hand, is under team control for another 5 years at very cheap salaries. Common sense tells us that Kershaw is on the upslope of his promising career, while Halladay is at the top of his game but 11 years older. How much longer does he have before decline? Sure, the Dodgers are World Series favorites (along with Philly) in the senior circuit, but does Halladay improve their odds in October? He’s got the same number of October starts as Kershaw, ZERO. As Philly is running away with the NL East, do the defending World Series Champs need Halladay? At the cost of a starting fielder and top prospects Kyle Drabek and Jason Donald? As is, they are on their way to a deep October run. Do they mortgage the future hoping that Halladay wins them the title, something that nobody can guarantee? Do the Yankees, already short on starting pitching, deal Joba and Philthy Hughes (shout out to carebear) for a pitcher with several times more wear on this tires than the two players offered for him? Sure, he had a couple good trades (Piazza, maybe Mo Vaughn), but overall, Steve Phillips was the meth addict of baseball general managers; he traded long-term pieces for short-term fixes. In the end, he had 2 playoff appearances to show for all of his awful trading. So Steve, stop doling out the advice to GM’s who still have jobs in the game. Nobody has even interviewed you for a GM position since you were canned, so perhaps they agree that you were a terrible judge of talent. Just stop giving us your opinion on trades just because you are on ESPN. Only talk about subjects which you have credibility with, like what kind of hair product I should use to get a ‘do like yours. You are currently browsing the The Blue Duck blog archives for July, 2009.